the mortuary or Pukumani ceremony (sometimes spelt Pukamani). The Kulama ceremony occurs towards the end of the wet season. It is a celebration of life and involves three days and nights of ritual body paintings, singing and dancing complete with the eating of yams according to a ritual custom. Concentric circles often appear as the main element of contemporary Tiwi patterns, representing the Kulama circle or ceremonial dancing ground. The Pukumani ceremony is the Tiwi people’s burial ceremony and includes singing, dancing and the making of special carved poles calledtutini as well as tungas and arm bands. 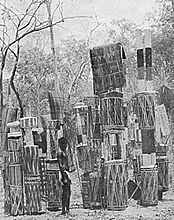 These large poles are made from the trunk of the ironwood tree and are carved and decorated to celebrate the dead person’s life and spiritual journey. Performance of this ceremony ensures that the spirit of the dead person goes from the living world into the spirit world. The Pukumani is a public ceremony and provides a forum for artistic expression through song, dance, sculpture and body painting. The ceremony occurs approximately six months after the deceased has been buried. The Tiwi believe that the dead person’s existence in the living world is not finished until the completion of the ceremony. The final Pukumani is the climax of a series of ceremonies that traditionally continued for many months after the burial of the dead. There is usually one iliana (minor ceremony) at the time of death and then many months later the final Pukumani. The ceremony culminates in the erection of monumental carved and decorated Pukumani poles which take many months to prepare and are impressive gifts to placate the spirit of the dead. These poles are placed around the burial site during the ceremony. They symbolise the status and prestige of the deceased. Participants in the ceremony are painted with natural ochres in many different designs, transforming the dancers and providing protection against recognition by the spirit of the deceased. Those participants closely related to the deceased wear decorated armbands (pamajini) during the performance. Pamajini are woven from the leaves of the pandanus or screw palm and are decorated with natural ochres and the feathers of the white cockatoo. The white cockatoo’s association with the Pukumani ceremony extends beyond the use of its feathers for headbands and armbands. It is believed to keep a sentinel eye on wayward spirits lost on route to the island of the dead. During all ceremonies a series of dances (yoi) are performed; some are totemic and some serve to act out the narrative of newly composed songs. Aside from these creative and illustrative performances there are those that certain kin – such as the mother, father, sibling and widow – must dance. When all is concluded and the last wailing notes of the amburu (death song) have died away, the grave is deserted and the burial poles allowed to decay. Not long before the death of Purrukapali, when all animals and birds were still men and women, Purutjikini, a boobook owl man and his wife Pintoma, a barn owl woman decided to perform the first Kulama ceremony. The white-headed sea eagle Jirakati was the first initiate and still wears the ceremonial paint. At the close of the creation period, the spirit performed a second and complete Kulama ceremony. This included the preparation of the poisonous Kulama yam for food and the performance of all stages of initiation. At its completion they agreed that this form of ceremony should always remain the same. When a gold ring forms around the moon during the final stages of the wet season Japara the moon man is performing Kulama. Inside this ring a multitude of star people sing and dance Kulama songs. This is the time to prepare for Kulama, the annual celebration of life. The Kulama yam is a round root vegetable found in the surrounding monsoon forest. It is highly poisonous when not properly prepared. While the yams soak in fresh water the earth oven is prepared. Sand and grass are pushed outward from the centre of the ceremonial ground and a large hole is dug. Dry sticks about one metre long are pushed upright into the ground around the oven and a fire built up of sticks, grasses and crumbled termite mounds. When the fire has burnt down to a bed of coals the oven is ready. The yams are placed in and covered with paper bark and sand. On the third day the yams are eaten, ensuring good health for all participants until the next Kulama. During Kulama many new songs and dances are performed. The composition of songs and dances was traditionally one of the duties of new initiates. Due to changes, perhaps only in the last two decades, initiation is no longer a part of the Kulama ceremony or a part of Tiwi social structure. The song and dance performances express the wishes and desires of the participants for a healthy and prosperous future. Large concentric circles often appear as the main element of contemporary Tiwi paintings, representing the Kulama circle or ceremonial dancing ground. They are icons of Tiwi spiritual belief.